We are Manufacturer of a wide range of products which include Plastic Container such as Plastic Round Containers, Plastic Mini Container, Plastic Container Set, Plastic Small Container, Sweet Container, Clear Plastic Container and many more items. Matching up with the ever increasing requirements of the customers, we are engaged in providing Air Tight Containers. 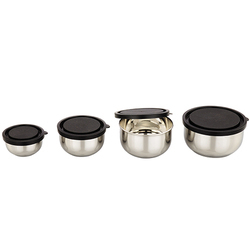 Airtight, food quality container suitable for storing ghee and other vanaspati products. We are engaged in providing our clients with air tight jars. These air tight jar are very useful for storage of edibles. They protect the edibles from damage and deterioration. - Fulfil all essential storage needs of your home with this power plus storage container set. - The beautiful set of container is completely air tight. • Fulfil all essential storage needs of your home with this Power Plus Storage Container Set. 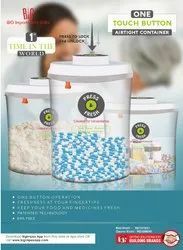 • The beautiful design of this set of containers, which is fully transparent with elegant white coloured lids, is completely air-tight. • Made of completely safe, non-toxic, food grade plastic.